Representing Clark’s urban education legacy — From left: Ricci Hall, UPCS principal and Clark alumnus (’97 history and Asian Studies, M.A.Ed. ’98); Kate Shepard, teacher, Clark alumna (M.A.Ed. 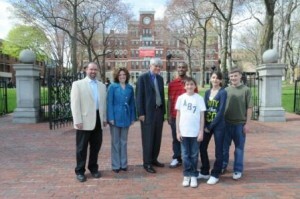 ’02), and current adjunct faculty at Clark (Shepard received an American Stars of Teaching Award in 2007); President John Bassett; Reed Powell, Clark senior and UPCS graduate; UPCS students: eighth grader Mark Basahaj and his sister Laurenka Basahaj, a senior and admitted Clark student; and eighth grader James Grady. Clark University President John Bassett today (April 29) announced the establishment of the Ruth and John Adam Education Fund, a gift of more than $14.2 million made to enhance Clark’s nationally recognized model for urban secondary education and reform, teacher-training and community education partnerships. The fund, resulting from the largest single gift in Clark history, was announced at a 4:30 p.m. press conference at Clark. Speakers included President Bassett, Worcester Public Schools Superintendent Melinda Boone, Massachusetts Secretary of Education Paul Reville, and Bowditch & Dewey attorney Michael Brockelman. John “Jack” Adam Jr. established the fund before his death in 2009 at age 94. The former Clark University trustee and CEO of the Hanover Insurance Company was a highly respected business leader and philanthropist. He also was a sharp observer of the American education system and the “fundamental connection between education and the underclass. The Adam Education Fund will support Clark’s Jacob Hiatt Center for Urban Education, which offers an intensive, full-year Master of Arts in Teaching program, designed to prepare Clark students interested in elementary, middle or high school teaching in urban settings. The Center provides support to schools in the surrounding Main South neighborhood and other Worcester Public Schools, exemplified by the highly acclaimed University Park Campus School, and also through use-inspired research and education reform initiatives such as Innovation Schools. These are integral parts of the expanded collaboration supported by the fund, which will enable Worcester Public Schools and Clark to promote this successful urban education reform on a national scale. — Undertake initiatives to strengthen Clark’s research profile around issues of urban education within the overall framework of use-inspired research. “The Adam gift provides a tremendous opportunity for the Hiatt Center to extend its commitment to bring the University and public schools together in powerful ways that increase learning and life opportunities for urban youth. We are excited to launch a new stage of our work,” said Thomas Del Prete, director of the Jacob Hiatt Center for Urban Education. Mr. Adam was president emeritus of Hanover Insurance Company, now known as the Hanover Insurance Group in Worcester. He was a member of Clark’s Board of Trustees from 1975 to 1981, chairman of the Mass. Board of Higher Education from 1972 to 1977, and president and a founding director of the Greater Worcester Community Foundation. Mr. Adam died Feb. 8, 2009, in Brewster. 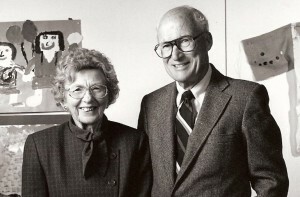 His wife of 55 years, Ruth E. (Maddock) Adam, died in 2001.